At the recent International Consumer Electronics Show in Las Vegas (CES 2011) Microsoft and Samsung unveiled the next generation Microsoft Surface. 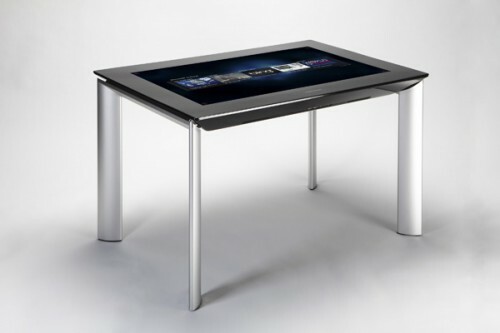 Samsung collaborated with Microsoft to produce a new thin LCD based design named the SUR40. The device has a slimmer form factor than the original Surface ( now its only 4 inches thick! ) and can be mounted either horizontally or vertically. The product uses an embedded AMD Athlon II X2 dual-core 2.9GHz processor in conjunction with an AMD Radeon HD 6700M Series GPU with DirectX 11 support. The 40 inch screen enables full HD 1080p with a 16:9 aspect ratio and a resolution of 1920×1080. The display consists of Gorilla glass bonded to an LCD screen and incorporates a new technology developed by Microsoft called PixelSense. Infrared sensors are built into the screen so that (essentially) every single pixel can act as a camera. This enables the display to see items such as fingers, hands and other objects placed on the surface. More than 50 simultaneous contacts can be detected. Developers can use the Surface 2.0 SDK to build applications for Windows 7 Touch PCs and the Samsung SUR40. Before the release of the Surface 2.0 SDK, however, developers can use the Microsoft Surface Toolkit for Windows Touch Beta which was released earlier in 2010. The Surface 2.0 SDK will be available later in 2011. The manufacturers suggested price for the SUR40 starts at $7,600 (US) and is scheduled to be available later in 2011 in 23 countries worldwide.